Hurricane Irma's wind and rain barraged Las Olas Boulevard in Fort Lauderdale, Florida. After three category four hurricanes struck the United States in less than a month in 2017—Hurricane Harvey in Texas, Hurricane Irma in Florida, and Hurricane Maria in Puerto Rico and the US Virgin Islands—rescue and recovery workers needed information about the location and extent of impact, fast. First responders were looking for people injured, trapped, or otherwise in need. Humanitarian organizations needed to deliver food, water, supplies, and medical care to victims. Federal and state agencies were coordinating relief efforts while ensuring safety and figuring out how to restore services. And insurers needed to begin fulfilling claims so people could start rebuilding their homes. With a limited number of boots on the ground in each affected location, everyone involved in the rescue and recovery work relied on eyes in the sky to report what was going on below. For this triple hurricane assault, these eyes came in the form of aerial sensors that produced accurate, detailed imagery so people and organizations could get a quick, up-to-date view of what was happening on land. To obtain and deliver this imagery, a coalition of leading geospatial firms formed a partnership with the National Insurance Crime Bureau (NICB). 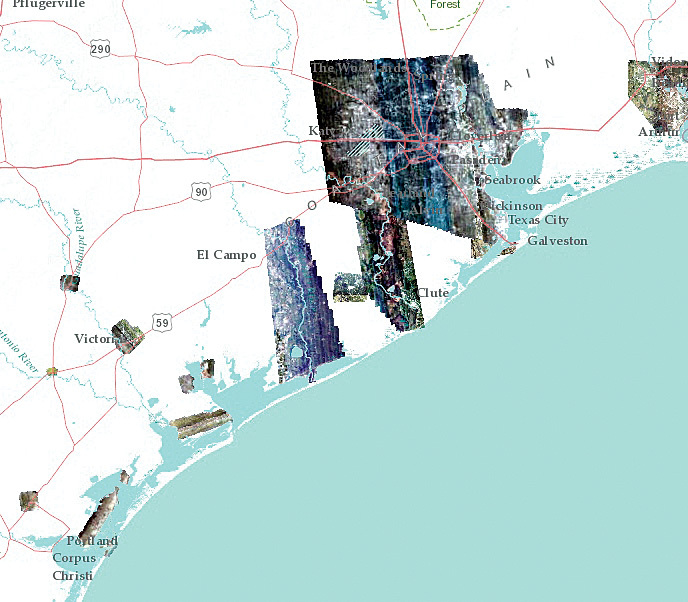 Together, they acquired and published high-resolution imagery for nearly 24,000 square miles across Texas, Florida, Puerto Rico, and the US Virgin Islands. Vexcel Imaging, an Esri partner that provides high-end mapping products and geospatial data services, managed the response, leading the efforts of some of the nation’s largest and most advanced aerial mapping companies, including other Esri partners Quantum Spatial, The Sanborn Map Company, and GPI Geospatial, as well as Keystone Aerial Surveys. Each of these organizations provided aircraft equipped with UltraCam vertical and/or oblique aerial sensors to ensure the highest-quality and most accurate imagery possible. Esri served as a key member of the coalition, and those involved in response and recovery efforts used an array of ArcGIS software and apps to access, visualize, analyze, and record spatial data. To get a clear picture of what was happening on the ground without having to be physically present in every disaster zone, the coalition collected 3-inch and 6-inch resolution top-down nadir imagery, as well as 45-degree oblique aerial views from four cardinal directions at 3-inch resolution. It focused its oblique imagery collection on concentrated areas that were directly in the path of each hurricane, as well as on locations that sustained considerable structural damage from winds. For larger areas where massive flooding occurred, the coalition used ultralarge-footprint UltraCam models to rapidly capture 6-inch nadir imagery. In addition to these aerial views, NICB equipped a vehicle with Vexcel’s Mustang mobile mapping sensor system to capture streetside photography. With this rich collection of imagery from multiple vantage points, rescue and recovery workers gained a clear view of which buildings had been destroyed, what streets were obstructed by fallen trees and electrical wires, and where the flooding made roads impassable—making it easier for them to get started with their work. Aerial imagery collected in the hours and days that followed Hurricanes Harvey, Irma, and Maria provided the most precise and up-to-date depiction of features and conditions on the ground. It served as a crucial tool in determining how badly wind and flooding had affected coastal communities, major ports, waterways, coastlines, and infrastructure. After a storm, it is a race against time to acquire, process, and make hurricane event imagery available to end users. For this series of hurricanes, the coalition collected about 100 terabytes of source data. In traditional mapping workflows, it could take weeks or months to process this data and create a set of orthophoto mosaics to serve as basemaps in various apps. Yet in these cases, as soon as a processing facility received the raw data, Vexcel software transformed it into the individual camera image (the standard output file type for Vexcel Imaging) and directly uploaded it to cloud storage. Simultaneously, Vexcel acquired data from global positioning systems (GPS) and inertia measurement units (IMUs) and processed it to provide georeferencing information about the camera locations. Additionally, Esri installed ArcGIS Image Server on a set of Amazon Web Services Elastic Compute Cloud instances and configured it to provide the coalition with dynamic image services of all the available imagery. Vexcel and Esri staff used ArcGIS to perform on-the-fly orthorectification based on the best collected orientation data and digital terrain models from the US Geological Survey. The dynamic image services were then added to ArcGIS Online as items, which enabled credentialed users to have automatic access to them in their apps and viewers. 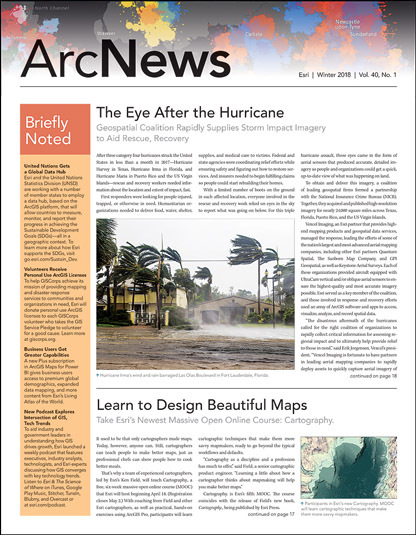 NICB also built a web app using Web AppBuilder for ArcGIS that allowed the public to enter an address or point of interest, immediately see imagery from before and after the hurricane, and take measurements—of fallen trees, the extent of flooding, and more—from both nadir and oblique imagery. In addition, the web app permitted first responders, insurance agents, the public, and employees from the Red Cross and the Federal Emergency Management Agency (FEMA) to add layers of public or private data, such as insurance policy information, on top of the imagery. This enabled them to see instantly which properties were damaged and which ones were okay. 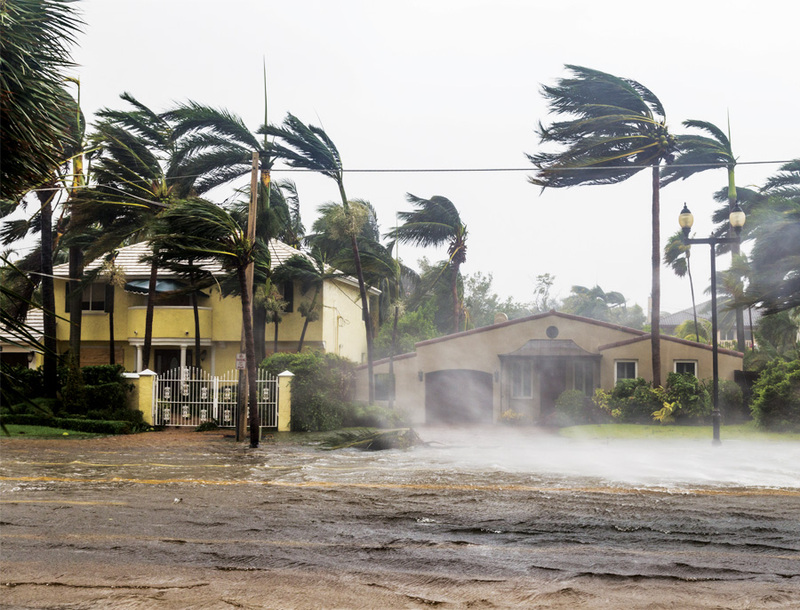 Thus, with no time to waste, hurricane response and recovery teams were able to receive imagery, information, and insight immediately via web services that connected directly to their desktops and mobile devices. 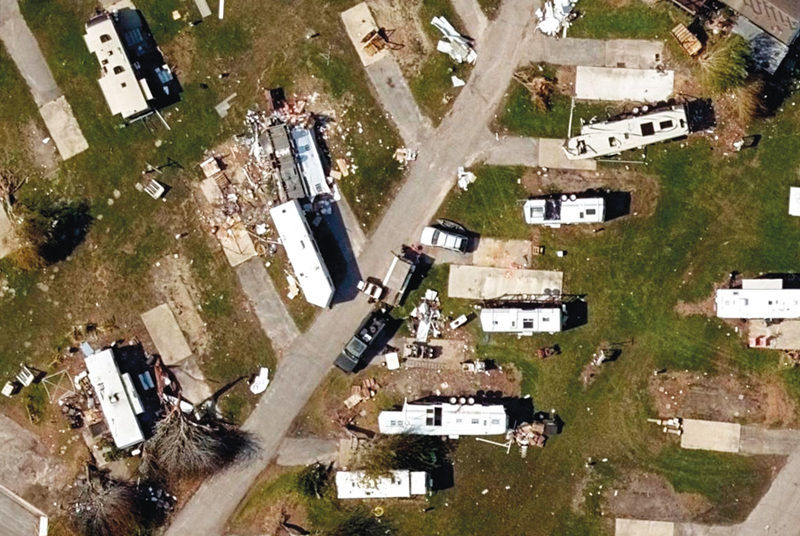 In the weeks following the hurricanes, the coalition acquired new aftermath imagery each day and added it to the service. Vexcel and Esri refined the aircraft orientation parameters and updated services with new imagery without having to make any changes to the apps, meaning that users continued to have a seamless experience. As people accessed the imagery, ArcGIS Pro and ArcGIS Image Server performed complex, on-the-fly processing so users could retrieve imagery more quickly and optimize the image display for their location. Unlike the traditional approach, where a user must orthorectify and mosaic all the imagery first, this new process took much less time and did not result in a loss of imagery detail. In parallel to creating the dynamic image services, processing the imagery in the cloud allowed ArcGIS Pro to create traditional static orthomosaics as tile caches, which were served for public use in ArcGIS Online. For such image processing tasks, ArcGIS was able to immediately deliver the best fit-for-use imagery and then create the georeferenced imagery later. To further improve image interpretability (the capacity of imagery to depict features such as trees, houses, and roads), Esri provided stereo orthos within the web apps. With the added height perspective, users could see overlapping imagery in stereo, or 3D, and get a better view of where the storm knocked down trees and recreational vehicles or winds ripped the roofs off houses. 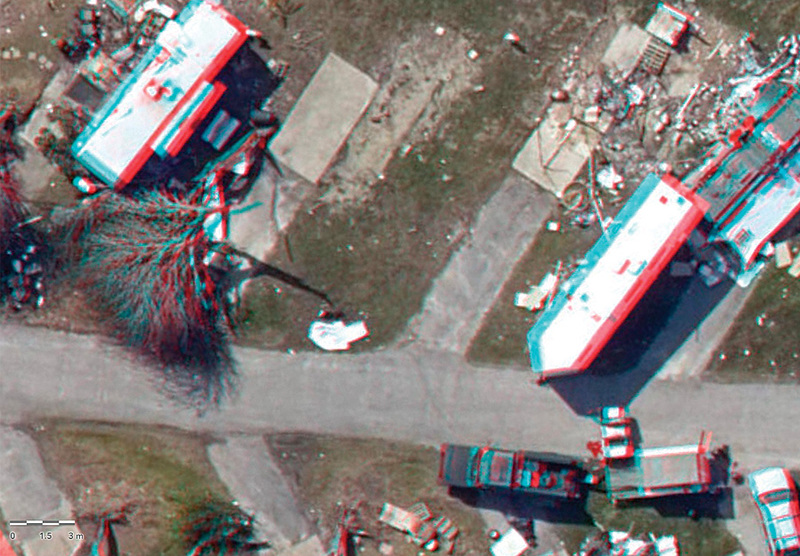 Furnishing imagery data within a GIS framework is making it easier to retrieve and use vital information for natural disaster rescue and recovery efforts. During Hurricanes Harvey, Irma, and Maria, coalition teams were able to quickly access and interpret imagery by using the Internet, cloud computing technology, and the ArcGIS platform. NICB made available on its website high-resolution aerial images of the areas affected by each of the three hurricanes. Users can search for an individual location in the address bar to view a before and after comparison. Read Gaining a Clear View of Reality, Fast to see how ArcGIS processes and serves imagery so quickly.